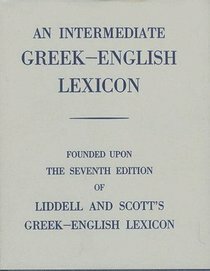 Founded upon the seventh edition of Liddell and Scott's Greek-English Lexicon of 1889, this is intended for use by those with an intermediate-level knowledge of Greek. - Publisher This abridgement of the world's most authoritative dictionary of ancient Greek is based on the 1883 revision. It includes some discussion of word usage, citing examples and characteristic phrases. Generally speaking, only words used by late writers and scientific terms have been omitted from the full lexicon. From Homer downwards, to the close of Attic Greek, care has been taken to include all words, as well as those used by Aristotle, Plutarch in his Lives, Polybius, Strabo, Lucian, and the writers of the New Testament. About "Intermediate Greek English Lexicon Dictionary"